Somerset, UK - How medieval is a medieval home asks construction historian Michael Heaton in the 2018 transactions of the Ancient Monuments Society where he takes an in-depth look at architectural salvage reuse in Whitestaunton manor house in Somerset. Heaton suggests that the 17th and 18th century reuse was polemical, and compares it to the use of spolia in continental Europe. The manor was owned successively from the 14th century by the Hugyns and Bretts, and was sold to Sir Abraham Elton in 1718. It remained in the Elton family until 1925, then in 2003 it was bought by Stuart Moore whose renovations Heaton meticulously recorded. Abraham Elton was Mayor and Member of Parliament for Bristol. A Dissenter (or non-conformist) of humble origin, son of a market-gardener, he pioneered Bristol’s brass, iron, weaving, glass and pottery manufacture, and incidentally supplied slave-ship owners with brass goods for bartering. 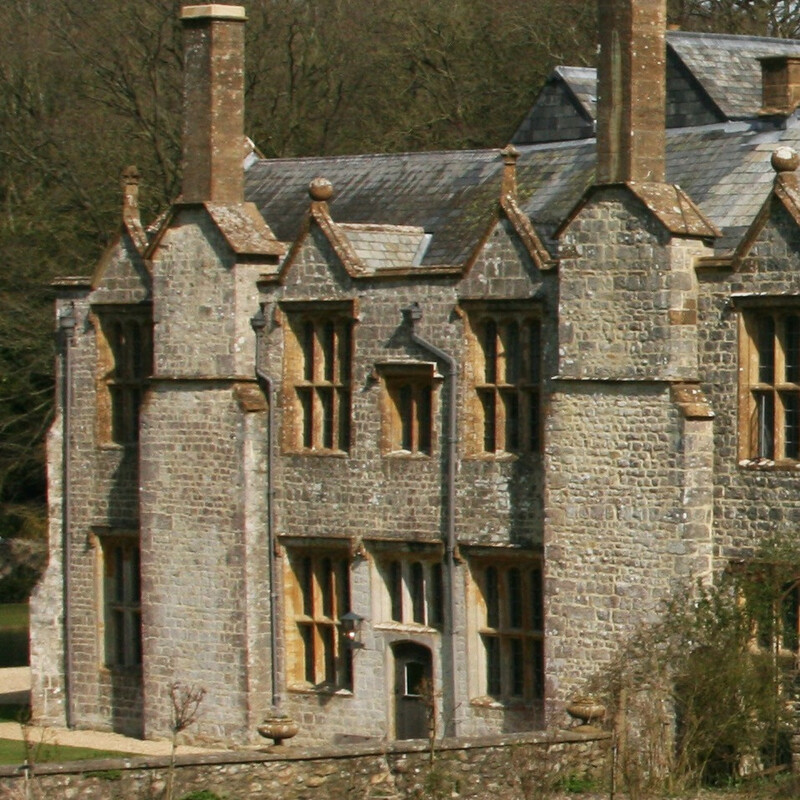 He bought Clevedon Court in 1709, Whitestaunton in 1714, became a baronet in 1717 and died a very wealthy man in 1728, leaving an inheritance of £100,000 (or £2bn in today’s money). Whitestaunton Manor had a chequered history: it was built near an iron age hill fort and ancient spring, latterly known as St. Agnes well. The Romans built a bathouse on the site (excavated by Time Team) upon the walls of which the manor house was partially built. The water from St Agnes well is warm and reputedly good for sprains and pregnancy [http://www.british-history.ac.uk/vch/som/vol4/pp231-238], which Queen Henrietta Maria, the staunchly Catholic wife of King Charles I, visited and was with child soon after [https://www.druidry.org/library/sacred-waters-holy-wells]. During the renovation works undertaken by Moore it became clear to Heaton that Whitestaunton Manor house was a hotchpotch of mysteries. The main timber staircase was pokey and windey using a mixture of reclaimed bits when, for a billionaire, it should have been a bit grander with proper landings. There were puzzles in the rubble stonework with apparently false artificially aged blind openings. Plasterwork and cornice, thought original until the renovation, turned out to have been reused. The 14thC hammer beam roof had inexplicably lost some of the supporting knees and knee sockets. Experts had differing views about the house. Heaton says that the reuse could possibly have religious significance. He cites reuse in Ireland and Europe being more extensively studied than in Britain, and that reuse of ‘spolia’, an academic term for architectural salvage, had more than simple economic or aesthetic value and could have had religious and political connotations. Of course, those in the salvage trade are familiar with that. There always have been, myriad reasons why building material is, or is not, reclaimed and reused when demolition or dismantling takes place. Sometimes salvage has a gender bias with women more keen to save and reuse, than men who may be more inclined to chuck it in a skip. Marketers latched on to women's salvage preferences which resulted in the 1970s salvage-stuffed Irish theme pubs, 1980s reclamation in fashion shop fixtures and flooring, and more recently and generally many retail and hospitality interiors. British building historians have relatively recently discovered evidence of magic and superstition. Old wood could contain the spirit of the living tree and could tell its story to those who listened, even to devout Christians, as in the ancient pome of the ‘Dream of the Rood’. Door locks and hinges had sprites, and the Roman god Janus, Viking Heimdallr and Celtic Ratis were guardians of doors and gateways looking in and out, forward and back. The lion’s head door knocker is a relic of a ancient guardian door talisman. Do people think of them as magic amulets now? Touching wood is the most common superstition in modern Britain, and is more prevalent in women than men. There seems to be no mention of the role that the female Hugyns, Bretts and Eltons might have had on reclamation and reuse. In discussing secondhand materials reused in another of the properties with which he was involved Heaton writes, ‘… some are arranged semi-functionally, such as window or door jambs, but others perform neither a functional nor a convincing aesthetic function … the spolia probably came from the unfinished house of Stawell’s father-in-law’ instead of ‘Mrs Stawell’s mother’. Of course, Mr. Stawell may have had good reason to request the reuse of reclaimed building materials himself, but since neither husband nor wife’s intentions are known, maybe the gender preference for the reuse should be assumed to be the wife’s not the husband’s. Could this be sexist? Has the general possibility of women having a historic influence on the built historic environment been overlooked, especially in domestic houses? Maybe UK conservation’s antipathy for reuse is a reflection of the men controlling it? In this essay Heaton draws heavily on European antique spolia and in his conclusion he writes ‘that, perhaps, Whitestaunton demonstrates a cultural continuity with the continent’ rather than ‘manifestations of simple economic utilitarianism or at best amateur antiquarianism’. In answer to his own question, ‘How medieval is a medieval home?’ Michael Heaton describes his essay as presenting speculative interpretations for the non-economic reuse of architectural salvage. Perhaps if he could interview all the old builders and owners of Whitestaunton, and their wives, he might uncover the real reasons things were done. Today, if an architectural salvage dealer asks a customer specifically ‘Why?’ the answer may be a mixture of fashion, sentimental nostalgia, spiritual connection to a past life, green ecofriendliness, design aesthetic, conservation of past craft skills and materials, appreciation of the old, good for the resale, planning requirement, but perhaps mostly the subjective result of serendipitous chance - and often of a woman.